We were over on the East Coast for the holidays in a rental by the coast. The house was a classic 80’s beach house, complete with zero sound proofing and minimal air conditioning. I am sure that this house had been host to many a joyful occasion over the year but the Giant Baby was having trouble sleeping. I decided that of all the options presented this morning, taking him for a trail-nap was the most appealing. Earlier in the week we had found out there was a clear trail only a stones throw from the house. With various members of the family meeting up on the beach for a bit of rook pool investigation and sandcastle building, my mother, Mrs Proff, and I set off with the Giant Baby in the magic nap maker (the Tula). The trail was easy to follow as it clearly is/was a maintenance access road. It wended its way through a peaceful forest (very different from the WA scrub I’m used to) and along the ridge where the view was spectacular. As advised by another holiday maker with whom my mother had been conversing with earlier, we descended on the other side of the ridge to find ourselves at a deserted beach. 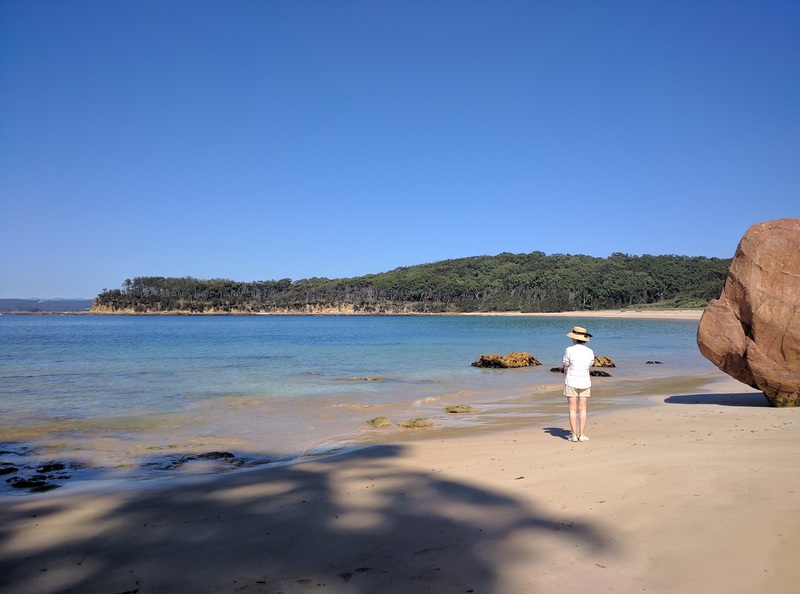 I know that there are a lot of deserted beaches in Australia, but to find one so close to a popular holiday village was blissful. Almost like a secret. I had originally thought we could do a loop by cutting back to the main beach area on the Sothern end of the trail. However, despite the trail only being about 50m from the car park (according to google maps), we would have had to slip and slide down from the top of the ridge to beach leavel to get there. There was an obvious path where others had gone before us but it was in no way a suitable route for me with a sleeping baby on my back. However, the longer return journey gave the Giant Baby some extra shut-eye. PS I also ran the trail early on our last morning at the beach house and nearly ran over some Kangaroos. I’m not sure who was more startled, them or me. I chose a slightly different route off the ridge at the end and found another, smaller, secret beach.